Confession: I've always loved the ghostly B&W quality of x-ray's. I usually manage to convince doctors to let me have them. 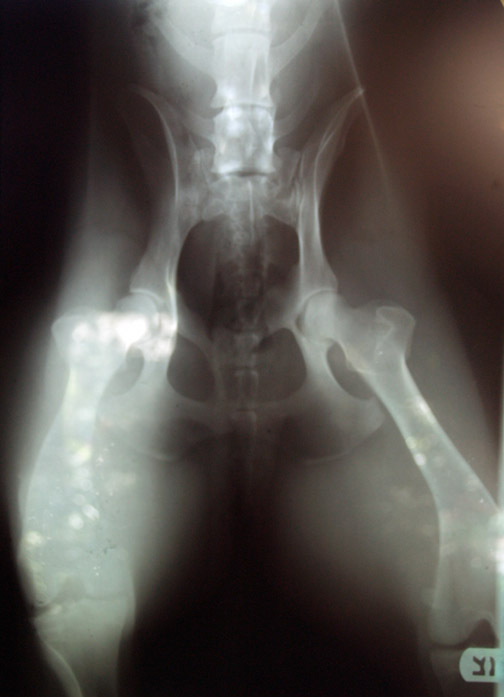 This is an x-ray of my greyhound's pelvis, taken this morning, after she took a nasty spill (is ok now). My obsession started long before seeing "The Man with X-Ray Eyes" with Ray Milland ( remember the last line in the film?... "if thine eyes offend thee, pluck them out"). I was the kid (sucker) that sent away for the x-ray glasses from the comic book's back cover. Once on, I really believed my eyes were penetrating women's clothing...was an imaginative adolescent. The orbs of light are not the chi or energy flowing through my canine....it's the trees behind the window where the pic was taken. Dave, This is a really great x-ray of your dog, by the way. It has a great luminous mysterious quality. Frame it up. 'Course I guess you'd have to rear light it.